After a number of years searching for The Riddle of the OSR Clones, I’ve decided to scrap all that and go back to my original D&D infatuation – Advanced Dungeons & Dragons. It all began a while back when I sat down and started reading in my old DMG, and I realized that I have all I need as far as D&D goes right here. I still have my old books from back in the day and a bunch of adventures on top of that. And new OSR style stuff can easily be ported over if I should want. At this point, I’m kinda burned out on D&D-ish games and I currently run Call of Cthulhu. After that, I plan to run some Symbaroum. After that, I reckon it’s time for some true old school AD&D, warts, high Gygaxian, and all! However, I plan to start some good old world building right now! Back in the day, I didn’t have money to buy setting stuff so I put my meager wealth on rulebooks and a few adventures, which I placed in my homebrew world along with homebrew adventures. For the new world, I will start small and then expand as we go. Back then I had this world map that I tried to fill with content, which turned out to be a killer job. The first part of my old world, heavily influenced by the RQ2 maps by William Church. This world eventually grew much bigger and as a side note I used the same setting for b/x, AD&D and RuneQuest 2. Even if we began with Moldway/Cook b/x, AD&D is the game I ran the longest during those early formative years and one that I remember fondly. I worked extra selling newspapers on the weekends to afford the PH and DMG and I got the MM from my grandparents one Christmas in Gothenburg. As the books came out I got them all and over time we added UA, OA and the Survival Guides as well. And I think that all those complicated extra rules were the beginning of the end for me. The game had gotten very complicated with all those extra rule mechanics and when AD&D 2nd edition was announced I redirected my interest towards RuneQuest 3 and other games instead. To commemorate this historic return to AD&D after 28 years (sic! ), this week I treated myself with the limited edition AD&D Premium Reprints, which arrived yesterday. These are among the last new copies in Sweden and I even had to order the Monster Manual from Germany as it is sold out over here (I believe it will arrive next week). The reprints are of awesome quality and I honestly can’t understand the critique that some people have directed towards the illustration quality – I think the illos are perfectly fine. Much crisper than the old books and fully functional in all their old-school ugliness/coolness. 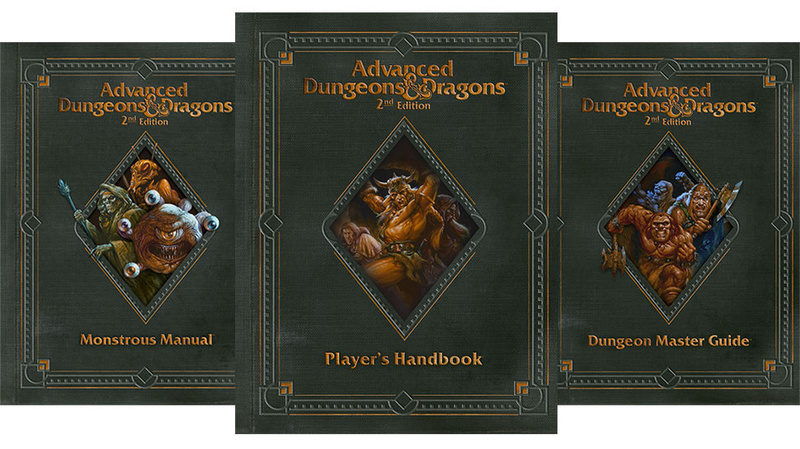 And definitely cheaper than the D&D 5e books. I also got myself a battered REF1 GM screen for a very reasonable price. Never had one of those as I used a home made one back in the day. Drawing of the adventuring party by one of my players (Johan Emanuelson), just before we stopped playing AD&D. From left to right: Emir – Fighter (w/ an unhealthy interest in pretty rocks); Sven – Fighter (badass); Daag – Assassin; Jean d’Arc – Paladin (of course); Zeb – Ranger (stinky and dirty); Casmir – Thief (sneaky and always ready to betray the other PCs. After getting caught red-handed stealing from the party, he was placed in a dinghy far out at sea and haven’t been heard from since). I plan to run the game as written, using stuff like to-hit modifications vs. differents AC:s and segments – things we didn’t use back in the day. After reading the books with adult eyes, I see that we let a lot of b/x-isms flow over to our AD&D games. The only thing I will add is some kind of simple task resolution system, preferably based on attributes. I also like the fact that nothing new will be added to the game – no new splatbooks or whatever. This means that I can concentrate on what I have and build my own stuff from that. As for future publications from the Lazy Sod, I might switch focus from Blood & Treasure to OSRIC instead. Haven’t decided on that yet. Final note: For those who might have noticed that my online presence has diminished greatly compared to before, I am still here. However, an increased workload and other personal issues have eaten up a lot of my spare time. I still run (and occasionally play) games. I still write gaming stuff. It’s only that I don’t post that much or publish stuff anymore. And besides the personal stuff, my interest in sharing and discussing online has petered out in direct relation to the increasingly combative, opinionated and aggressive online climate and I simply don’t have the time or the interest to argue over non-game related issues with strangers online. I have enough of struggles in real life, and I don’t need it in my escapist feed as well. It’s as simple as that. The last few weeks I have been reading up on a game I missed entirely – AD&D 2nd edition. We stopped playing D&D in 1988-1989 something, just before 2e hit the shelves. However, returning to D&D a few years ago I started buying some 2e stuff on the cheap, and now I have quite a collection on my shelf. I planned to use it for our adventures, but fell into the OSR-clone marsh and scrapped 2e to be used for inspiration and to be “cannibalized” for ideas and cool stuff. This christmas when I got D&D 5th edition a lot of people compared it with 2e and I brought out my 2e books for a more thorough reading. And I must say that I really like this version of the game. Never being a devout fan of the high Gygaxian prose of 1e, the 2e style suits me much more, as does the form and layout of the books. Contrary to most (it seems) I definitely prefer the 1995 black edition of the books. There’s been a lot of yapping online over demons and devils being renamed or that the assassin, monk and half-orc disappeared and other little things, but at the same time I think that 2e brings so much other cool stuff to the table, making up for those “transgressions” many times around. And they reappeared later – the monk and assassin in “The Scarlet Brotherhood” supplement and the half-orc in the “Complete Book of Humanoids”. If I’m going to GM an advanced D&D game in the future, I will definitely try out 2e! Also, keep an eye open for future posts here on 2e. I will write about some personal reflections from the perspective of an bx/1e GM trying out the new 2e. And for me it IS a new game. One that I am much more exited about GM:ing than the new D&D 5e game. Where I blog about non-OD&D RPGs, comics & Hooligan Subcultures.